Your Dog in a Hot Tub: It Might Be Fun but is it OK? You’ve probably seen these incredible pictures of dogs chasing balls underwater. They are fascinating. You can’t stop staring in fact. And, as a pet owner, you probably love spending time with your dog. In fact, Fido might do pretty much everything with you. Could this include hot tubbing? Well, let’s discuss. First, as much as we dog lovers may not want to hear this, dogs are not people. You must be aware of a few things to protect your hot tub, yourself, and your pet. Here are a few things to think about and remember when deciding whether or not to take a dip with your dogs. Before bringing your dog into the hot tub, you must consider cleanliness. You may bathe your pet regularly and keep them inside, but all dogs pick up small bits of dust and debris in their coat throughout the day. When your dog gets wet in the hot tub, there is a good chance that any dirt, grime or debris within its coat will get into the water, not to mention the hair that is shed. This can tax hot tub filters or make the tub a bit less pleasant for you and the other humans in the household. If you still really want to take a soak with Fido, and we really don’t advise doing so, it is really important to rinse him or her off vigorously with a garden hose prior to jumping in. This will free up any loose fur, dander, and as much dirt and dust as possible. Coincidentally, a good rinse prior to hot tub use is also advisable with people, although you don’t need to resort to the garden hose for your own pre-spa rinse. A shower works better. You also want to be aware of any flea or tick shampoos or sprays you might use on your pet. These can separate from the dog’s coat and mix with your hot tub water. Although your filtration system will remove these things, it can take time for the water to be entirely circulated and cleaned after your dog takes a swim and you may have to use a defoaming agent to clear soap and shampoo residues. If you intend to hot tub with your dog you also have to think about the damage that could be done to your spa’s surfaces. Many dogs panic when they get into a hot tub. Some seem to dislike the walls on all sides of the water. Weird right? Your dog’s first instinct will probably be to attempt to climb out. Your dog’s claws can scratch your acrylic hot tub surface and cause damage to other parts of the spa. If you’re still intent on a dip with Fido, keeping claws completely trimmed and rounded and making sure you’re always present if the dog is swimming can help you avoid damage. When you own a hot tub you must think of safety for everyone. This includes your pets. Be sure to keep a hot tub cover on your unattended spa at all times. This will keep your pets, as well as children from accidentally falling in. If you are still planning to swim with your dog, even while you’re there, you must consider it’s safety in the water. Even if you think that your dog can swim well, you never really know what could happen. You would surely be heartbroken if your dog drowned or were injured in your hot tub. Yes, it looks a little ridiculous (although this little guy pulls it off nicely), but if you insist on bringing your dog in the hot tub, you may want to consider a dog floatation device. These simple dog life jackets can help your pet stay afloat and feel safer in the water. One more safety issue to consider: heat. 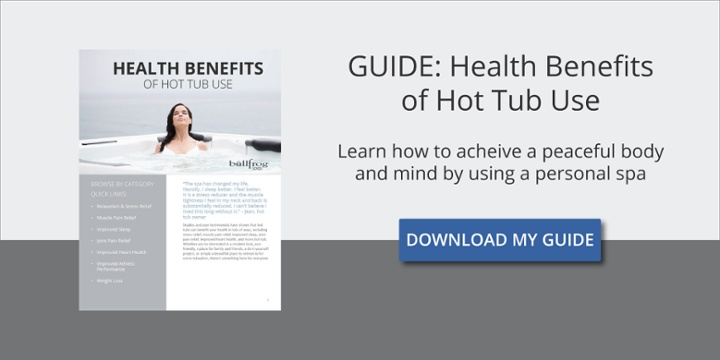 As you probably already know, hot tubs are typically kept at temperatures of around 102 degrees or so. Although this might feel good to you, it can cause your dog to get overheated very quickly. Dogs don’t sweat and they could be at risk of getting overheated in temperatures this high. Those that are overweight or particularly susceptible to the heat can suffer even more. Your dog could potentially develop heat stroke or even be at risk of death in a shorter amount of time than you think. You should also consider how your dog might be affected by the sanitizing chemicals in your hot tub. For example, your dog’s skin or eyes could be adversely affected. Also, many dogs have the temptation to drink the water that they’re swimming in. This may not be good for their health. One alternative to sharing your human hot tub with your dog is to create a doggy hot tub of their own. This is probably the best plan for doggie spa relaxation. Even dogs that don’t generally like the water can enjoy a nice warm soak. In fact, this is a great way to introduce dogs to water and to help them overcome a fear of jumping in. To create a dog hot tub simply fill a tub or container with fresh water just above lukewarm. There won’t be any of the chemicals, filters, or sensitive surfaces to worry about. Introduce your puppy slowly and soon you will find that they absolutely love their own dog-safe hot tub. A dog hot tub that is all their own will keep you, your hot tub, and your pet safe, happy, and relaxed. There’s simply no question that hot tubs are an enjoyable and relaxing experience for almost all of us. However, although you might wish that your dog could spend a bit of time with you in the hot tub, it’s just not a good idea. Of course the decision of whether or not a dog can use a hot tub is always up to you as a responsible pet and hot tub owner. But once all factors are considered, it’s our opinion that it is better to keep your hot tub a pet-free zone. Keep in mind that even though your dog may not be joining you inside the hot tub you can always encourage your dog to hang out alongside the hot tub so that it can be part of the festivities and can keep you company while you’re taking a soak. There have been many games of fetch played while I’ve been enjoying the spa and my dog enjoys the yard and companionship. Or, go ahead and get pup a cozy tub of his own. Now that’s a relaxed dog! I think you pretty wrong. Dog in hot tub is fine. In fact there are businesses for dog pool therapy. They keep the pool water above 90 for the therapy. Thanks for the feedback. That’s a good point and some dogs do really enjoy a swim in 90 degree water or so, but it’s probably not safe in typical hot tub temperatures over 100. Ultimately of course, it’s up to the dog’s owner to decide what’s right for them, their hot tub, and their pup.